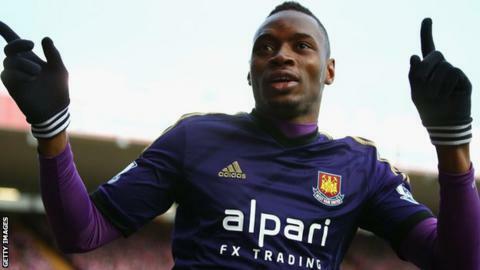 West Ham and Senegal striker Diafra Sakho says he has been "saddened" and "angered" by criticism of his absence from the Africa Cup of Nations. Sakho was ruled out of the competition with a back injury but came off the bench on Sunday to score West Ham's winner in a FA Cup tie at Bristol City. "You doubt my love and my patriotism," the 25-year-old wrote on social media. "The dream to contribute to the victory of my country flew for this year but is not dead." He added: "Never doubt the lion sleeping in me, as I never doubt the passion that burns within you." Sakho suffered a recurrence of an injury against West Brom on 1 January and was ruled out of the tournament in Equatorial Guinea, which began on 17 January. The match against the Baggies was his last game prior to returning at Bristol City on Sunday. But a senior Senegal official accused the Hammers of a "lack of respect" over the forward's withdrawal. Senegal wanted to assess Sakho themselves but the Hammers said he could not travel. West Ham boss Sam Allardyce, who described the treatment of an injury to Sakho while on international duty last year as "outrageous", defended the Upton Park club's conduct. "He's still unable to fly," Allardyce told Talksport after the win at Ashton Gate. "We had to drive him down in a limo on Saturday afternoon, but other than that he said he can get out on the pitch and just see how he goes. "Today was about putting him on the bench with the hope we didn't have to use him, but in the end bringing him on was the most important tactical decision for us. "Yesterday I spoke with the chairman and said he looks alright. We don't think we're doing anything wrong with what we've done and how we've approached it."